The Bosville Hotel is a contemporary boutique hotel with a re-imagined restaurant & bar. 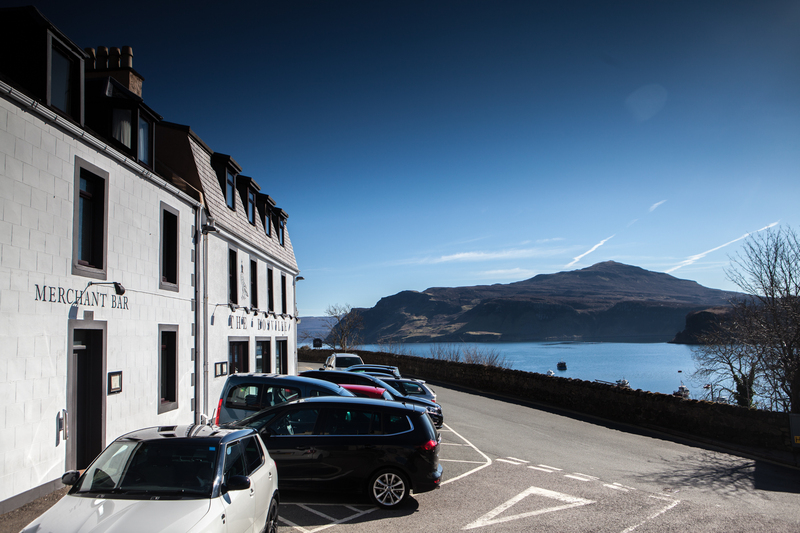 Situated in the heart of Skye’s picturesque Portree harbour, the Bosville is a part of the Perle Hotels group, offering the ideal hotel accommodation for the discerning traveller. 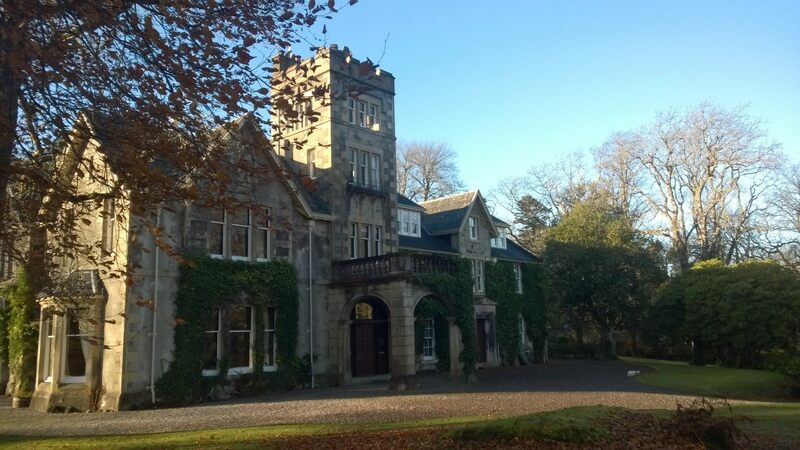 A quality 4 star hotel offering lovely accommodation and warm, friendly Highland customer service. We have a reputation for our superb, award-winning restaurant, Dulse & Brose, which offers cuisine created using the fresh local produce from the Isle of Skye and the Highlands of Scotland. Nestling in the shadow of the Cuillin, Coruisk House, our 300 year old croft house has a history of welcoming guests for more than 100 years. We serve the best Skye sourced ingredients, prepared simply to show chef Iain Roden’s flair for flavour. Our tiny and intimate restaurant on the wild side of Skye offers a peaceful retreat. Our warm welcome and fine wine list, selection of Highland gins and single malts are all served to make our guests feel welcome in our island home and so that they want to return again and again. We are open by advance reservation but unfortunately we are not able to offer same day bookings. At Creelers we cook simple, traditional French country dishes – using the very highest quality, fresh, local produce we can get our hands on – and the emphasis is on lack of pretension and value for money.You will also find some Cajun dishes and a couple of our very own (now mildly famous) inventions as Chef David Wilson is easily bored! A la carte menu are lovingly created using only the freshest produce – Skye langoustine, Scallops, Scotch Beef and Venison. There’s a carefully selected wine list, the Malt Whisky selection comes highly recommended and there’s Traditional Skye Ale to enjoy in the Chart Room where bar meals are also available. Afternoon teas are available each afternoon with homemade scones or traditionally made shortbread. We are a family run, 3 room yoga B & B. All rooms are quiet, spacious and comfortable with en suites and can be set up as twins or doubles. Breakfast is a main event at Glenview, we celebrate Skye’s local produce and can cater for all needs by our by our award winning chef. Our yoga studio is in the heart of the B & B and we offer early morning mediation and yoga classes every day for our guests. We also have a naturally dyed yarn shop on site if you are an avid yarn lover! With such an abundance of local produce, the peace, tranquillity and gentle pace of island life takes on another dimension at Greshornish House in its secluded lochside location. Home baking, freshly landed seafood and a daily changing dinner menu offers a wide range of culinary experiences. Taste the freshness! Freshly picked fruit and vegetables from our garden enhance the wide range of other items delivered from neighbouring producersby the Food Link Van.Booking essential for all meals. Please telephone or visit our website for further details. 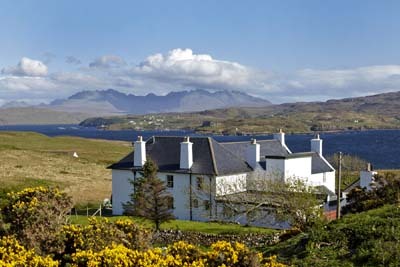 This small and privately owned hotel on the beautiful Isle of Skye is the perfect setting for holidays and weddings. 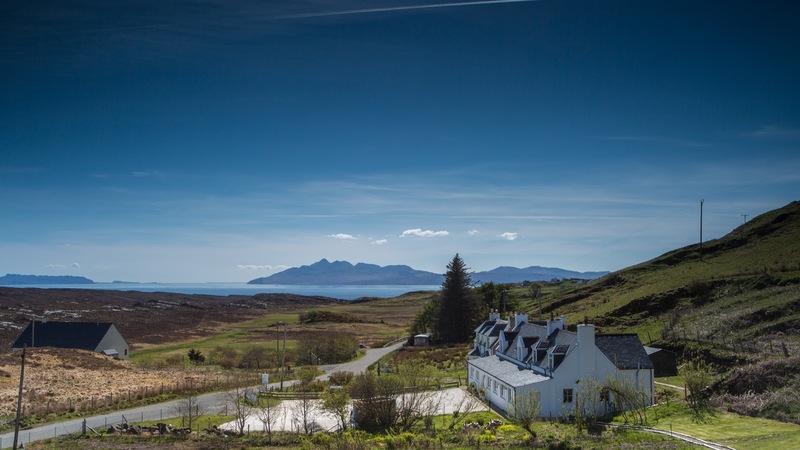 Situated on the sheltered south of the island, the hotel boasts expansive views over the Sound of Sleat to the hills of Knoydart on the mainland. Our menus reflect the abundance of fresh local produce from the island, including langoustine landed at the adjacent stone pier and venison supplied by our fruitful estate.The wine list is personally chosen by Lady Noble. After dinner enjoy coffee and petit fours in the comfortable lounge with its stunning views of Isle Ornsay Bay to the lighthouse.For a more informal atmosphere you can dine in the comfort of the Praban Bar with its open log fire and panelled walls. We offer an extensive menu including local seafood and our own venision dishes. Enjoy freshly prepared dishes using where possible only local produce. Langoustine landed on the pier perhaps ten minutes earlier. Fresh Scottish Scallops. Our beef is from our local butcher and who can resist fresh venison, Scottish salmon, monkfish and traditional Haggis, neeps and tatties. Vegetarians are not forgotten with creamly homemade lasagne, mushroom tagliatelle, goats cheese and veggie haggis! Plus more. Try Isle of Skye ice creams and locally produced cheeses. Then sit in our thatched traditional Skye Black House Bar with a roaring oepn fire and contemplate your day or listen to hte live ceildh music played throughout the year. Contemporary Scottish restaurant with classic French influences on the Isle of Skye, by Chef Michael Smith. Located in the Dunvegan Castle car park, the recently refurbished MacLeod Tables Cafe offers good quality freshly prepared hot and cold food and great bean to cup coffee at affordable prices accompanied by a warm Highland welcome. OPEN DAILY between the 1 April and 15 October from 10am to 5pm. Red Skye Restaurant situated in the Old school House built in 1876 has recently been taken over by a partnership of Alastair (Head Chef), his wife Nicola and friend Mary. This trio have been working together over the last 6 years in the hospitality business. Alastair has over 12 years cooking experience and is focused on bringing innovative food featuring locally sourced seafood and game to your table. They are committed to showing you some of the famous Scottish hospitality by their dedicated team of staff members. 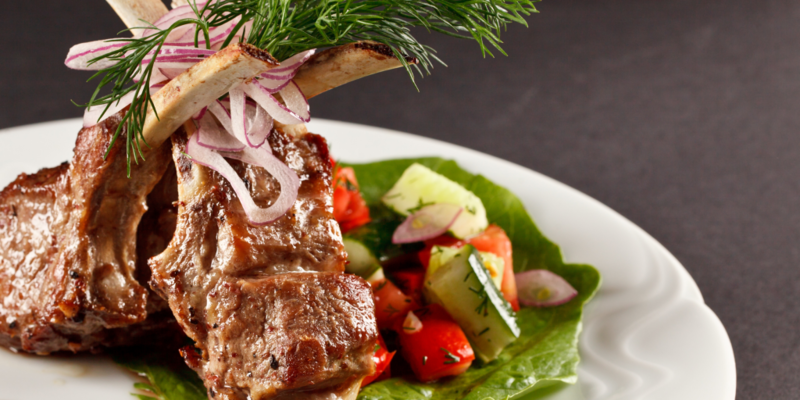 We are pleased to welcome you to experience good quality food using the best of local produce. Enjoy friendly service in our restaurant located on Portree’s historic harbourfront. Our quayside location offers picturesque views. The restaurant opened in April 2006 and has become a firm favorite with tourists and locals alike looking to sample the excellent fresh seafood on our menu. Sea Breezes Restaurant is located on Quay Street which his part of a Conservation Area and it is believed that the stone walled building was constructed around 1890. Dining is always a special occasion. Our à la carte menu in ‘West Pier’ restaurant and our ‘57° 27′ Restaurant’ both offer the best of local produce brought together with skill and enthusiasm by our team of talented chefs. Skye Getaways offer self-catering holiday accommodation in Dunvegan with extra touches to make your holiday even more special. Our welcome packs include locally-sourced food. 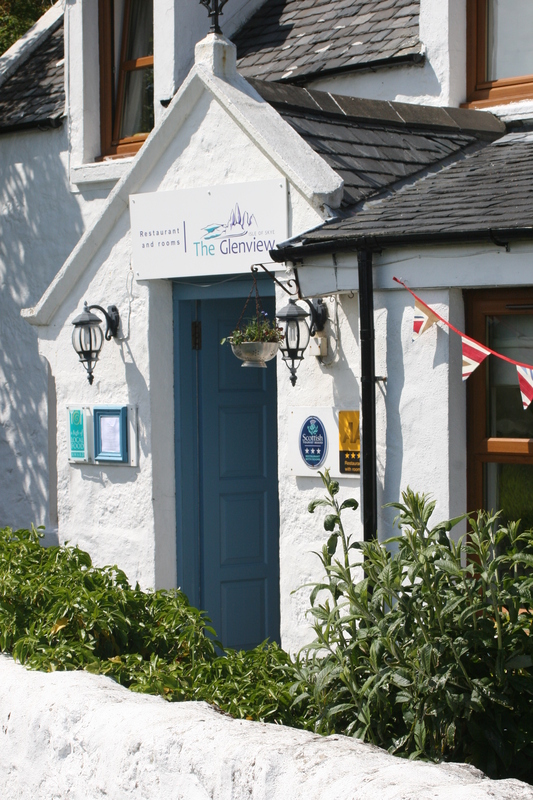 Our accommodation offers a comfortable and relaxing place to unwind after a day exploring the lovely Isle of Skye. www.skyegetaways.co.uk. 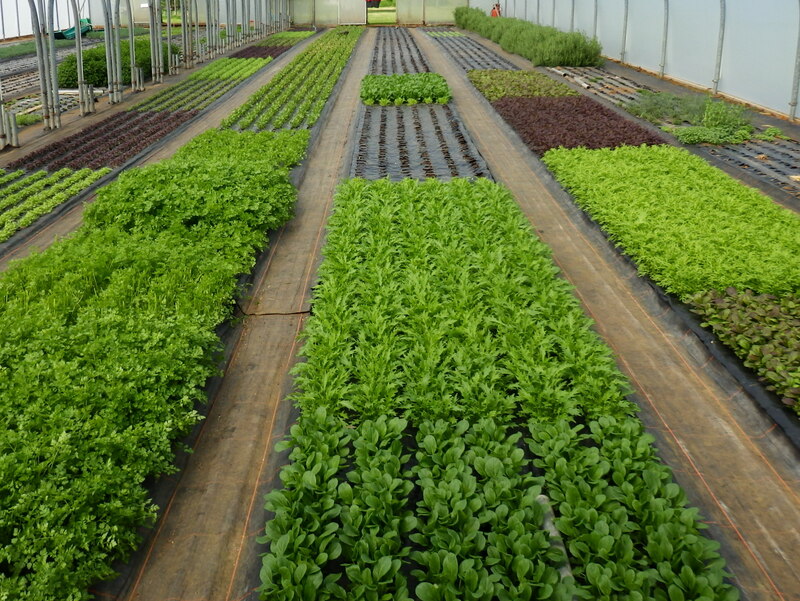 Specialist grower of high quality vegetables for hotels and restaurants since 2002. 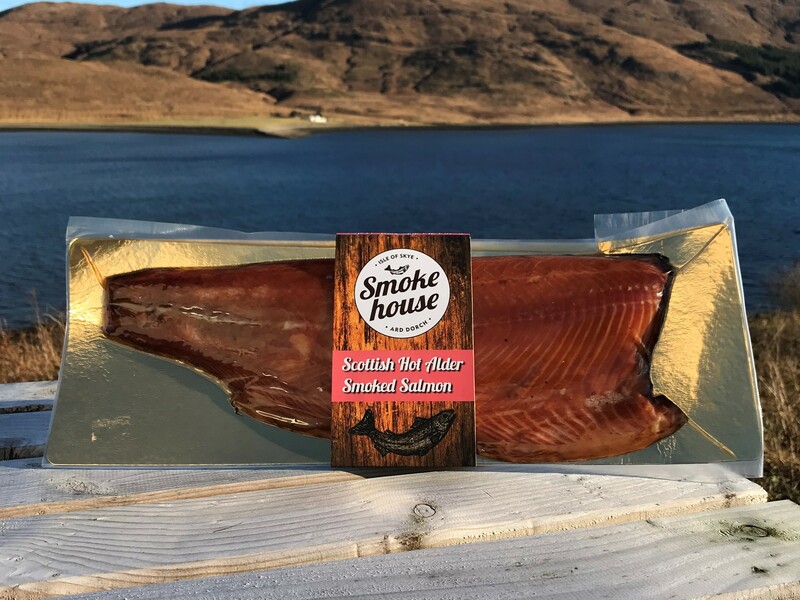 All produced from our croft in Totaig, north west Skye, harvested and delivered the same day with a personal and reliable service. Produce range includes baby carrots, baby leeks, baby turnips, kale, broad beans, french beans, potatoes, cabbage, mangetout, sugar snap peas and courgettes. We pride ourselves on eco-friendly production and packaging, and low food miles, by using the food link van for our deliveries. Angus & Teresa McGhie wish to welcome you to Stein Inn on the shores of the beautiful Lochbay in the far north west of the Isle of Skye. We off traditional inn food using the best that Skye and the Highlands can offer, which would not be possible without the Food Link Group. We are delighted to support them because they offer the freshest and best product possible. Come and find out for yourselves. But don’t forget to sample the local products in bottles and kegs as well!! Award winning hotel on the waterfront specializing in local seafood and the best of Highland Beef! Spectacular views over Loch Carron. Menu featuring local fish, shellfish, beef and game. Comfortable rooms and great food! It is rare that the food in any restaurant truly reflects its location quite as much as it does at The Three Chimneys and this is something that has contributed to the restaurant’s huge popularity over two decades. The great taste of local food is what the restaurant’s worldwide reputation is most famous for. Although dishes are creative, modern and exciting in concept, they often have a traditional twist associated with Scotland’s amazing culinary heritage. The genuine quality and seasonal freshness of the ingredients rarely fails to delight those tasting the finished dish when it is served to the table. Comtemporary waterfront bed & breakfast.Evening meals on request. All meals make use of the wide array of artisan local foods avaiable. Taste Local Award winner. Food at Toravaig is vibrantly fresh and you’ll enjoy classic modern Scottish country cuisine of good quality. 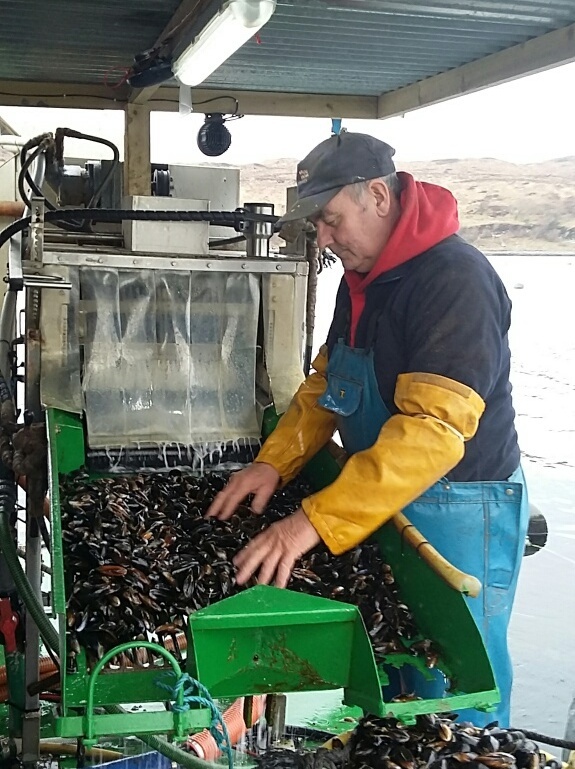 The ingredients are often local – with mussels and scallops from nearby lochs. Our à la carte menu hosts a good range of prime fish and shellfish, beef, lamb and game. Enjoy unsurpassed views and food at our AA 3 Rosette restaurant. Innovative and inventive use of a wide range of the best local produce, including Orbost Estate venison, Skye lamb and seafood. Enjoy a Scottish house-party atmosphere in our Victorian dining room. We serve three-course table d’hôte dinners focusing on fresh, seasonal ingredients – some even home-grown in our kitchen garden.